Salmon is one of those good-for-you foods that you don’t feel any guilt eating. This version adds spinach, ricotta, and roasted red peppers to make it really delicious and filling! This is an excellent weeknight meal. It only takes 30 minutes to make, which is so nice! It’s also a simple and easy recipe that any “normal cook” can accomplish! Usually fish doesn’t really fill me up, but these did the trick! It also helps that I had good sized salmon fillets. My husband and I both loved them. The original recipe actually called for sun dried tomatoes instead of roasted red peppers. I’m sure that the sun dried tomatoes would be delicious too, but the peppers is just what I had on hand. Go with whichever one suits your tastes! Heat oil in a large skillet over medium heat. Add onions; cook, stirring, until soft, about 3 minutes. Add garlic; cook 1 minute more. Add thawed and drained spinach, roasted bell pepper, salt, and pepper; cook, stirring, 2 minutes more. Remove from heat; let cool. Add ricotta; stir to combine. Season with any additional salt and pepper, to taste. 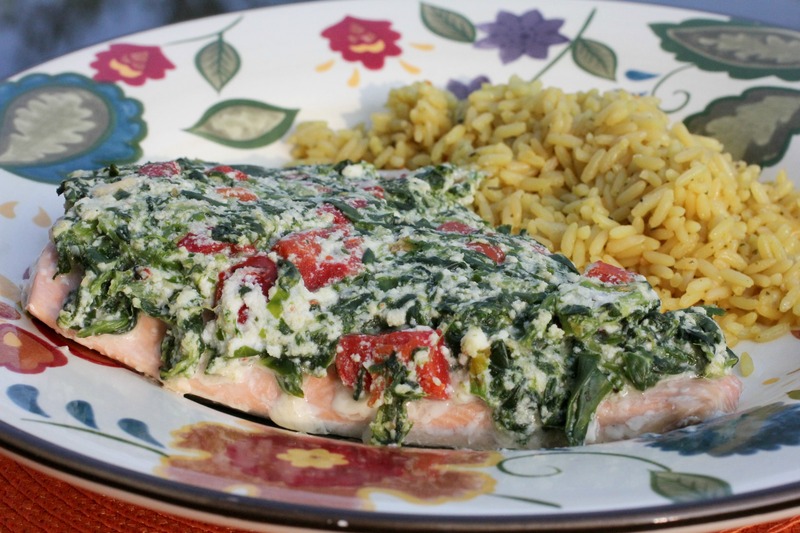 Pack about 1/2 cup spinach mixture on top of each fillet, matching the shape of the fillet. 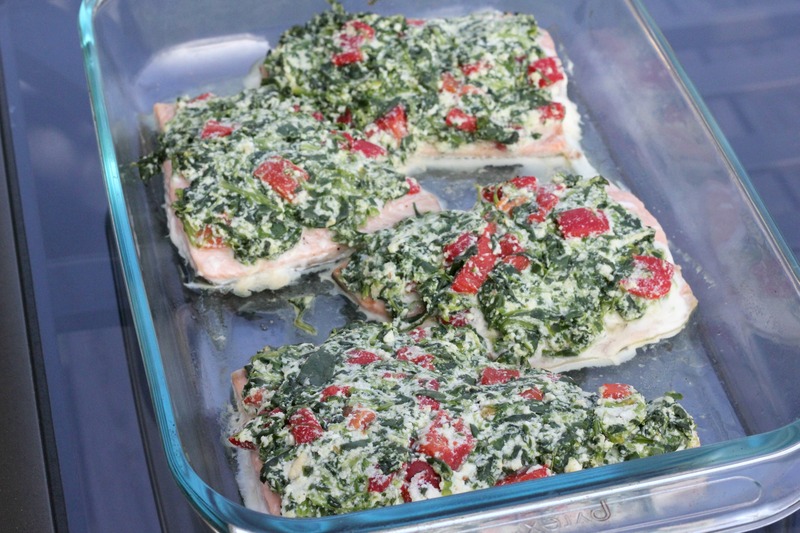 Place fillets on a rimmed baking sheet or in a glass baking dish; bake until cooked through, about 15 minutes. 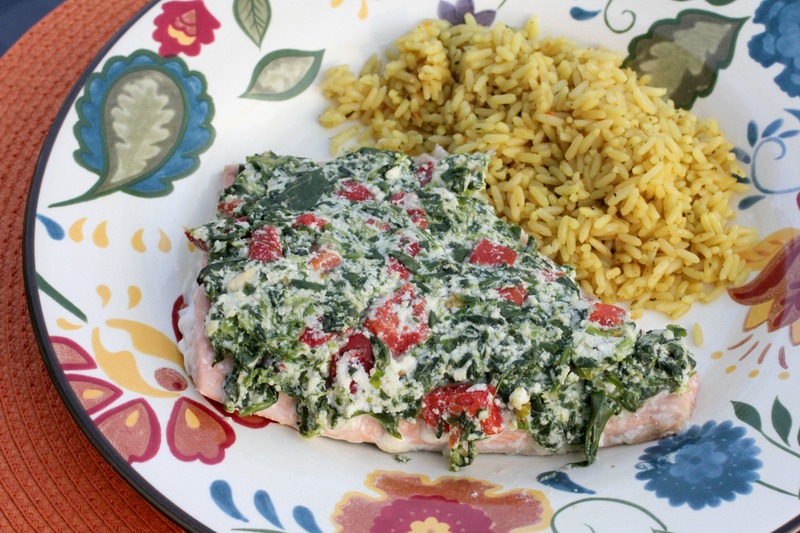 I’m certain I could make a meal just with the spinach-ricotta topping What a wonderful weeknight dinner (love the colors of the spinach and peopers too)! I’d also use the topping to stuff inside a thinly pounded chicken breast Thanks for the inspiration this afternoon! The colors are one of my favorite things about this recipe! And it would be delicious with chicken! Hope you like it! I think it’d be great on chicken! This is a great recipe. Simple ingredients, quickly prepared, delish. Nice job.